If the power mode is in ON: Seat heater - The HI setting heats the seats faster than the LO setting. 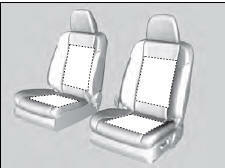 Seat ventilation - The HI setting ventilates the seats faster than the LO setting. 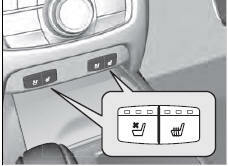 When a comfortable temperature is reached while using the seat heaters in HI, select MID or LO to keep the seat warm. Heat induced burns are possible when using seat heaters. Persons with a diminished ability to sense temperature (e.g., persons with diabetes, lower-limb nerve damage, or paralysis) or with sensitive skin should not use seat heaters. Do not use the seat heaters and the seat ventilation even in LO when the engine is OFF. Under such conditions, the battery may be weakened, making the engine difficult to start.